For all kinds of reasons we still had to post the blog on the last leg of our 2013 trip. Like each year, as soon as we arrive on our winter mooring we are immediately swept up by “winter life” which quickly pushes barging and all that comes with it to the background. This year it was not just meeting with friends and family that we had hardly seen this summer, but we also were immersed in (planned but hard hitting none the less) medical arrangements and in (unexpected and unplanned) the purchase of a permanent mooring. We’re fine now again and the purchase – about which more below – is about to be concluded. Quiet has returned and with that the time to write the last blog-entry. After two weeks stay in Paris (which we enjoyed so much that we will go there again next year) we left by the canal St. Denis, that joins the Seine in the North-West side of Paris. It is clearly not a tourist route and it takes you right through a less pretty and less prosperous part of Paris, but not less interesting. From the Seine on the Oise Northwards with a stop-over in Auvers-sur-Oise, the village where Vincent van Gogh and his brother Theodore are buried. I was a bit sad to find both graves looking very decrepit and neglected, in a village where everything revolves around Van Gogh, making quite a bit of money out of him. The distance to the Netherlands is here already indicated because Zundert is Van Gogh’s birthplace. Via the canal du Nord which we, contrary to others, don’t mind barging we went to Antoing in Belgium. Just South of the border we ran into a spot of bother. Just as we were trying to get to a mooring in a shallow spot, our propeller got stuck. We never knew what had happened, but it was clear that something had hit the prop as it had stopped turning. After pausing for deliberation, moving to and fro and in the end a bit of luck the prop worked again, but we couldn’t assess the damage, if any. We crept towards the nearby lock where we were allowed to moor ‘cause of our mishap. 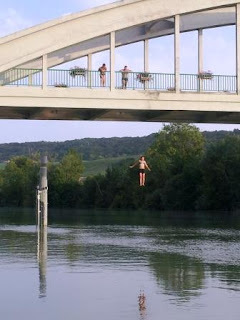 We rang our insurance who advised us to carry on and to find a dock, should anything be wrong. Opposite us there was a crew of VNF working on the embankment and they offered to help with their sloop, but even they couldn’t get at the prop. Others later told us that they had gotten into the canal themselves, which never crossed our minds, probably because we’re not keen swimmers. We then cruised on, problem-free, until in Amersfoort we heard something ticking, by the sound of it something sticking out from the prop. Once we were moored in Amersfoort, our neighbours in the marina, the fire brigade, inspected our propeller, as part of their diving training. 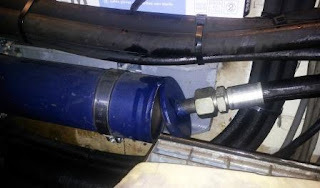 And, to our amazement, they brought up the remains of a steel cable, apparently gotten stuck on the drive shaft. They then inspected the prop, which they found undamaged. When we did the conversion a few years ago we invested in a “rope cutter”, a kind of knife mounted on the drive shaft that cuts ropes and lines. At that time Michel always said it was the most expensive piece of metal on the ship, but we now think it was a sound investment as it has probably been cutting heaven knows what in those past years. 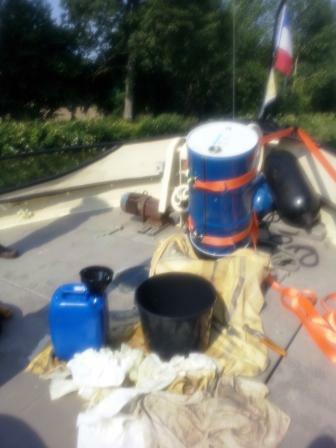 In Antoing we topped up our diesel tanks for winter and waited for friends that joined us there on their own barge. 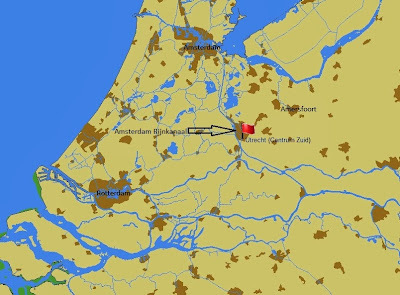 Together we cruised via Brussels, the river Rupel to Antwerp and the Biesboch homewards. Summer had left us, the nights had become chilly and the mornings were misty. Although our geraniums were still courageously blooming, spiders were busy building their webs, always a nice sight when they’re all dew covered. And then we were back in Amersfoort, having done about 2400 kilometres, clocked 440 engine hours and having passed 450 serviced artefacts, 360 of them locks. As said before, we bought a mooring. Our long-time planning contained the idea of looking for a permanent mooring in a few years’ time, maybe even buying one, but we don’t need one right now as we cruise extensively and can always get a winter mooring someplace. Once we cannot or won’t cruise anymore we can still live on-board ‘t Majeur, but preferably close to what we find important, as there are shops, cinemas, theatre and the library. In a town, obviously, but we also want a bit of greenery and quiet around us. For a ship of our size a needle in a haystack, hard to find. As you may understand by now, we did run into it by chance and we decided not to sniff at the opportunity. Situated at the outer rim of Utrecht’s centre, only one bridge and a lock away from the Amsterdam-Rhine canal. A quiet neighbourhood, lots of green, 15 minutes to the train station by bike. A perfect spot to live in and to start barging from. With the mooring comes a ship, so we consider ourselves fleet owners now. 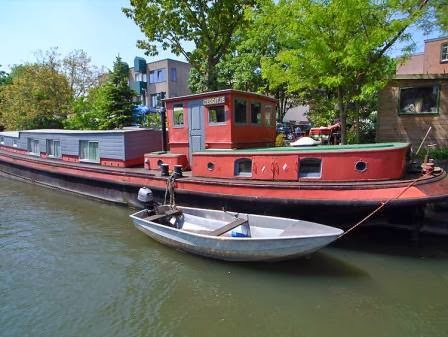 The ship is a 1927 Katwijker, converted to houseboat, but still maintaining the old looks, it just lacks an engine. The ship has to be sold, anyone interested ……? For now we will let the ship as a houseboat, the way it is now, until we can sell it or when we decide to moor ‘t Majeur there. All in all the last few months have been a stressy period, but we’re still healthy and very happy having secured this mooring for our future use. We are now planning next year’s route for which we already have several options. Before we start barging again we expect to become grandparents first, as our first grandchild is due by the end of March. As soon as our 2014 planning is ready and the web site is brought up-to-date we will send out a mailing. And next year, when we are barging again, we will keep you posted of our adventures here as well. 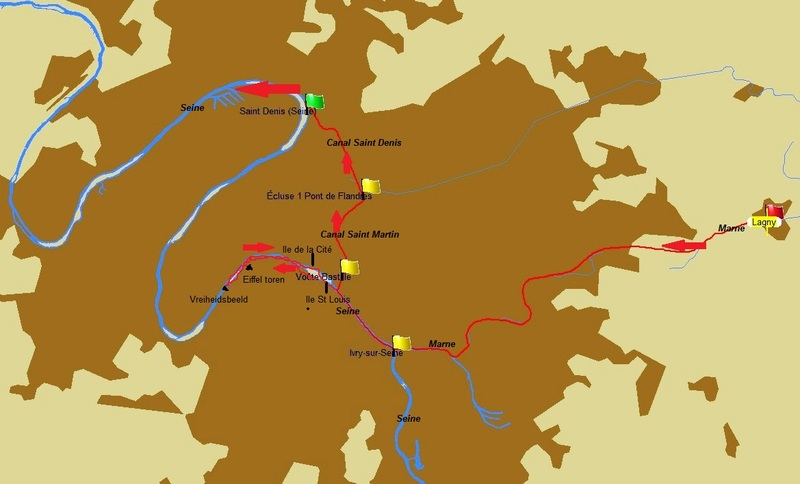 This entry begins without a map, as the route to Paris is already on the previous one. Later on you’ll find a map with our trip through Paris. In the first lock after Orconte, where the last blog ended, our journey comes quickly to an end also. When entering the lock Michel gives me a hand sign indicating trouble. When I am up front we can only use sign language because you cannot hear one another. It appears something has snapped in the hydraulics system and further inspection reveals that the thingy that dampens the pressure has come apart. Thus there is no pressure on the steering and on the bow thruster. 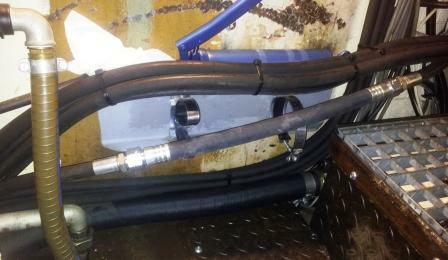 The system contains about 60 litres of oil and that has been forcefully emptied into the engine room. Luckily the tear is on the underside so most of the oil went straight down on the bottom, but still …. a mess! As it happens we were on a small canal, no other traffic and calm weather (this could have happened when entering the Kreekrak locks, in between the big commercials and 4 Bft). We managed to reverse, backing out of the lock and to the canal side. That is, about one metre out as it was too shallow, but spud poles and a gangway took care of that. Not the best of mooring spots but it would have to do till the problem was fixed. We were en route this Friday morning to Vitry-le-François where we hade made a reservation for a car to have a bit of fun on shore, visiting a few vide greniers among them (they are a kind of car boot sales). 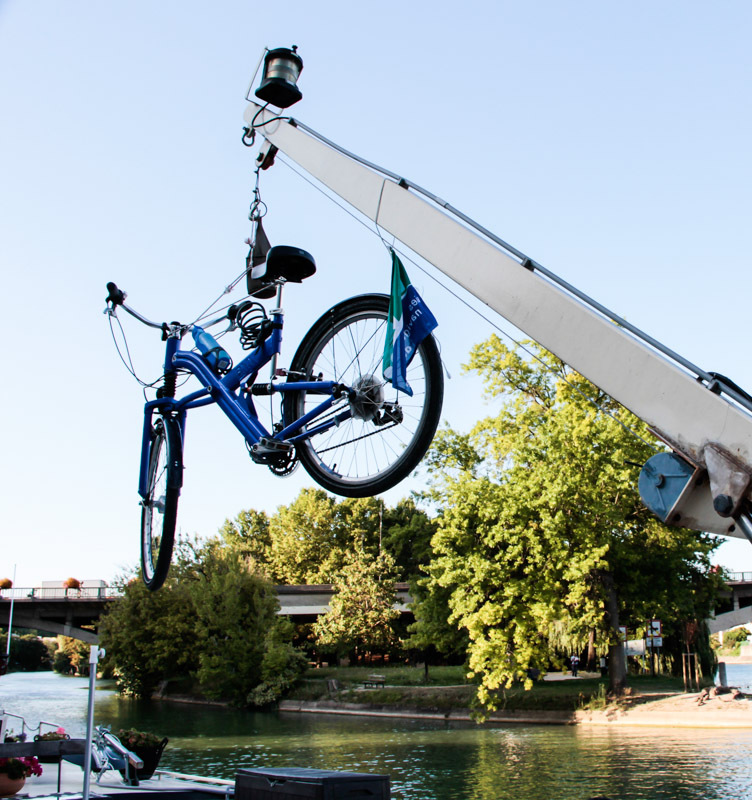 using all our strength to unload the drum – easy in comparison to unscrewing the damper – and then hoisting the drum on board with our little crane. Then it was time to begin with our weekend as we had no intention to forfeit our nice plans because of this mishap. Sunday night Michel got into the engine room to clean up, at least it was a bit cooler then and next day some real work was waiting; fixing the system and getting 60 litres into it. Unfortunately the opening for the filling in the engine room is rather awkwardly positioned, which was amended by fixing a hose with a funnel from the outside. A bigger problem was how to kip the drum slowly, there being no handholds and it weighing a ton. So, by putting the drum on top of a few tyres, holding it in the sling from the crane, we could tilt it bit by bit. 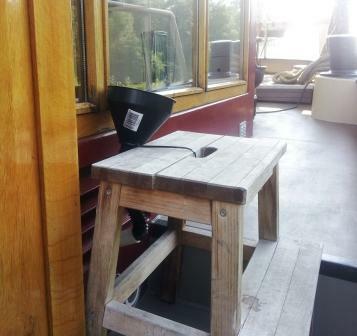 From the drum into a smaller drum, you just cannot aim at a small hole straight away, into a jerry can, taking the jerry can to the back, empty it into the funnel, going to the foredeck and do it all again. When you have to do this some 25 times, sun burning down, a 26 metre ship seems a long stretch (we should have gotten up at four o'clock). I would have preferred a small yacht at that time. And then the dreaded moment arrived, testing the system and moreover testing if the tube had been properly fastened. Fingers crossed, toes curved, tight bum, Michel started the engine and slowly got the pressure up. We are still cruising, so you may conclude from that that we did well. After cleaning a bit of spillage – unavoidable – and returning the car we did not treat ourselves to a well deserved beer but left this unfortunate mooring straight away. We then cruised to Condé sur Marne, via a few well known spots from the leg up and after that it was all new territory, along the Marne to Paris. When cruising, insects touch down on the ship, especially on the antennas, they stay with us for a while and after a good rest they disappear. They’re often special, with beautiful colouring, that you cannot see when they are flying. It’s fun to be able to make such nice pictures with our new super camera. Starting from Tour sur Marne we were on a stretch that we had been looking forward to, because everyone says that the Marne is so nice. And we were not disappointed, it’s really beautiful and very calm too, we only encountered very few boats. That may be good for us but, as said before on this blog, it is not a good sign economy wise. And this guy in his canoe doing the length of the Marne may be brave, it is not really a contribution. From Tour sur Marne to Meaux what you see is vineyards, vineyards and vineyards and some beautiful, old villages in between the vineyards. We of course visited a champagne house, not a major one where tourists line up for but a small entrepreneur, who does his own growing, wine making and selling; he gave us a grand tour of the premises and could tell us a lot about his company. It’s hard work, indeed, but the product still sells very well. Everywhere in this region you can see the tell tales of doing well. And of course we bought a few bottles of champagne and, yes, it did taste very well. We made a few nice walks in between the vineyards, leaving our bicycles behind as it was climbing from the waters edge up and quite steep sometimes too. All along the Marne the moorings were used by swimmers and sun bathers, who sometimes, alas, had to give way to us although we tried to keep to the end of the jetty as much as possible. Once we had left the canals we couldn’t use our spud poles anymore as the banks are shallow. 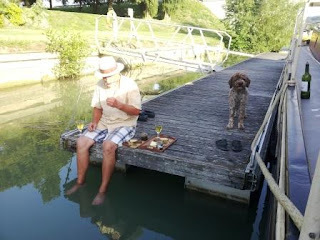 So pontoons have been installed but then the water is too deep for spud poles. After Meaux there was less and less greenery, no vineyards and more and more built areas. Big city approaching. 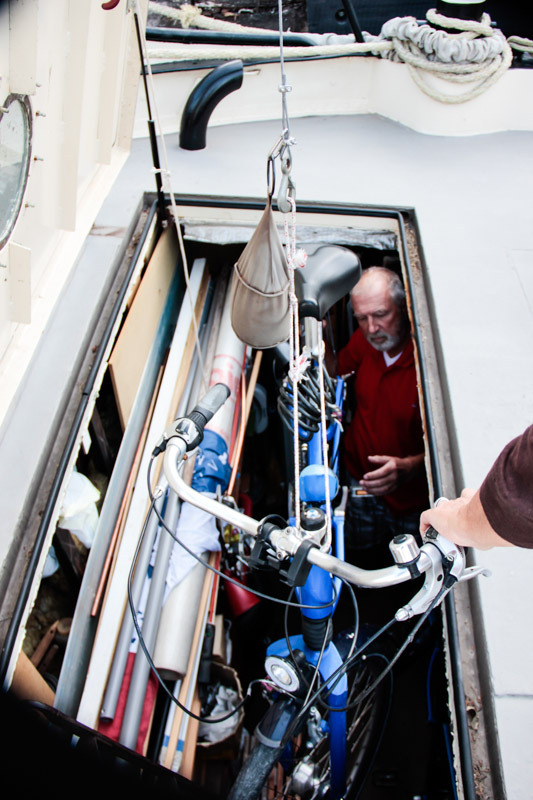 Before mooring in Paris we decide it’s a sensible thing to remove all stuff from the decks. It at least doesn’t induce people to steal or to throw stuff in the water from pure boredom. 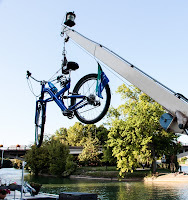 Everything goes down the hatch into the foc’sle , even the bicycles – a first . They were the reason the hatch has this particular format. The evening before entering Paris we moor in Joinville, just in front of the tunnel. In the morning a little boat comes alongside and Michel is asked in German whether he speaks German. It appears to be a Polish couple that have no idea how to reach the traffic post for the tunnel in order to gain entry. And then, after that tunnel, we get off the Marne at Ivry onto the Seine and we are in Paris for real. We have to get off the Seine at the Arsenal onto the Canal St. Martin but we decide to make a real tour on the Seine to see all the highlights first. We have seen them all more than once in the years past but doing it again, cruising on our own ship gives it a special flavour. It turns out that traffic on the Seine at the Ile St. Louis is monitored by traffic lights because it is partially one way traffic, something you don’t notice from the quay side. That we didn’t know, that Paris has its own Statue of Liberty, decidedly smaller but beautifully positioned on a island. This was our turning point, going back on the other side of the Ile de la Cité and Ile St. Louis, straight into the Canal St. Martin. Now here is a very special waterway, 4,5 K long right through Paris, the first one third via a very long tunnel underneath the Place de la Bastille and the Boulevard Richard Lenoir where there are strategically placed ventilation shafts that give you a nice few from the top to boats passing underneath. In the tunnel signs indicate which street you are crossing. 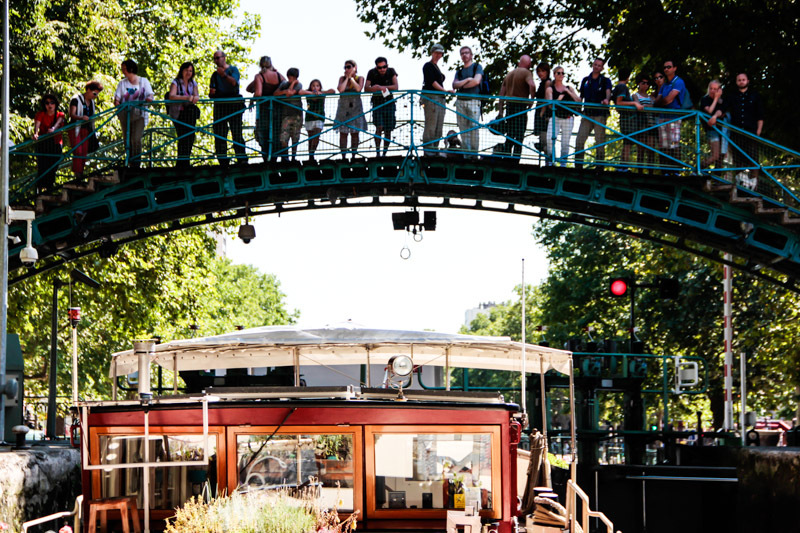 Coming out of the tunnel you immediately enter the first of four double locks as the Bassin de la Villette is 25 metres up from the Seine. The canal itself, it dates from 1825, is very picturesque and takes you straight through living, shopping and working areas. Next to the tourists there are many people on the quay sides eating their lunch or just reading. As it is mostly the tourist boats that sail by we were quite an attraction, people actually following us to the next lock. And then, after the last lock and the Place de Stalingrad there is the Bassin de la Villette, where ships moored in the olden days with all kinds of cargo for Les Halles. Now it is a place where the Parisians come after work to pick-nick, to play jeu de boule or just for chatting. There is a very lively atmosphere and just before we arrived there had been Paris Beach for a few weeks. It’s a great place to start from to tour Paris and to ‘be’ a Parisian for a fortnight. 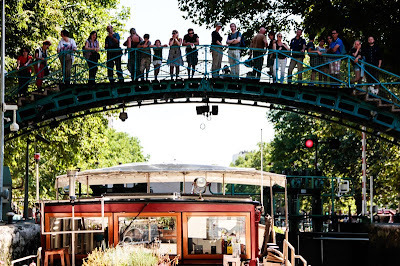 Just as we are moored, up shows the tine boat with the Poles again, now approaching from the other side as they had continued on the Seine and than returned by the Canal Saint Denis. They want to come alongside again to hear from us how they can get to Belgium. Michel tells them they have to do an about turn as they have taken the wrong canal and are now heading South. When he asks them if they have no charts (indeed, from Poland, without any maps) they are deeply offended and sail away. In the right direction, so far. We have crossed all of Paris on bike these two weeks, as they run an excellent rent-a-bike operation where you drive from ‘station’ to ‘station’ and, when you are a bit keen, don’t have to pay extra. The metro is more expensive and not as much fun. 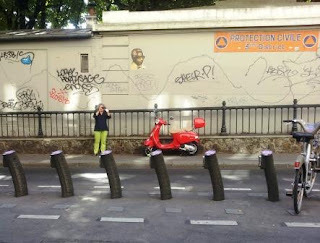 Paris is biker-friendly, all bus lanes are cycle path as well and there a quite a few bikers. 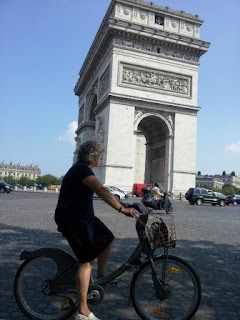 We even did the Champs Elysée cycling to the Arc de Triomphe, going round and back again. 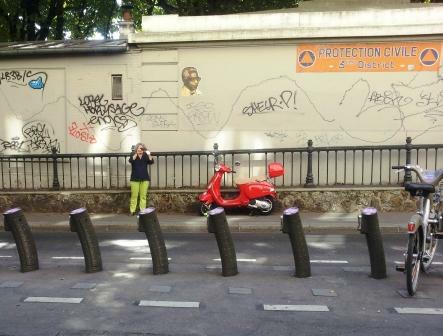 Once but never again as there is no cycle-path there and cars drive like mad around the Arc. But you have to do it once! After two weeks our stay was over and we had to carry on. We had decided to leave by way of the Canal St. Denis towards the Seine although we had heard many a story that it was dirty and not very agreeable. We thought we wanted to see it and we afterwards thought it was not all that bad. Although there is big contrast with the Bassin. You pass through the poorer quarters of Paris, where there is a lot of renovation being done and in a few years time it will be quite different. There are a lot of tramps and it is a sorry sight when you see people that live in caravans doing their laundry in the, not all that clean, water of the canal whilst the kids play in a pool filled no doubt from the same source. Upon entering the canal there is a very narrow, steep lock that at the end boasts one huge door, swinging in, revealing a kind of gate. It was symbolic for our farewell to Paris, but we’ll be back next year. Meanwhile we are slowly cruising back to Holland. The weather is trying its best to prepare us for autumn and winter as it turned cold and wet all of a sudden. 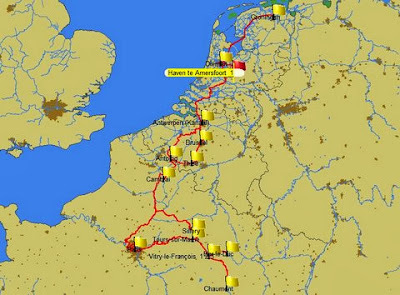 We do hope that it is temporary and that we will be able to enjoy the trip through Belgium and the Netherlands before mooring in Amersfoort for winter. More about that in the next blog, the last one for this year.